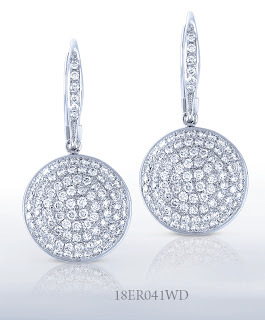 These stunning earrings from Vanna K's Korvara Collection will light up a room with their sparkle. These beautiful earrings drop slightly from the ears in true fashion. The spiraling circle of micro-paved diamonds is created with 1.0 Carat of Diamonds per earring, resting in beautiful 18K White Gold. The technique of the micro-paved diamonds once again lends itself to a truly unique, truly luxurious design. Come view our entire selection of fashion jewelry to choose your perfect gift for that special someone from Vanna K.